Lynn Zonge – Resource Concepts, Inc.
Ms. Zonge draws from more than twenty years of experience with watershed analyses, public outreach, and environmental reporting. She specializes in fluvial geomorphology, surface water hydrology and geology of the Sierra Nevada and Great Basin regions, and community outreach. She assists in environmental permitting on federally managed lands in Nevada and northern California, including NEPA, CEQA, Endangered Species Act, and Clean Water Act compliance. Projects include wetland delineations and environmental assessments for utilities, trails, and recreational facilities. Ms. Zonge’s watershed analyses have focused on large developments or areas devastated by fire and/or flooding. She provides Properly Functioning Condition (PFC) analyses, Rosgen classification, and other geomorphic characterizations. Ms. Zonge works with project partners to prepare open space plans, habitat conservation plans, river recreation plans, and other land management plans in conjunction with an excellent interdisciplinary RCI team. Ms. Zonge is a successful grant writer and grant manager. Ms. Zonge is certified by the Soil and Water Conservation Society as a Professional Soil Erosion and Sediment Control Specialist, and by the State of California as a Professional Geologist. Lynn loves the family atmosphere here at RCI, and the support and encouragement to do what we love. We have a fabulously diverse staff and we enjoy exchanging ideas. We get to work every day with smart, joyful, people that are accepting and supporting so we can all be our best and help our projects to be their best. She enjoys kayaking and rafting our beautiful western rivers, playing guitar and sharing music with others; hiking and biking, gardening, and being with her beautiful daughter and fantastic husband. 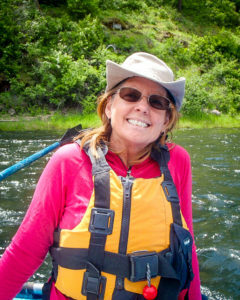 Ms. Zonge is the secretary and treasurer for the Truckee River Foundation, a local non-profit aimed at improving recreation on the Truckee River.